The things you see when you don't have a rifle. The woman behind him doesn't look too impressed. The more astute readers of this blog will have twigged that it was indeed me who spoke on Triple J's Top Shelf Radio program yesterday afternoon. They contacted me and asked me to chat about Free Comic Book Day, which is today, and I was more than happy to do so although I think it slipped under everyone's radar, thankfully. It was good to know that a national broadcaster with a large listening audience would give time over to such an event and although the spot only lasted for a few minutes, we managed to touch on some of the problems that local creators face when it comes to getting product out there. This email found it's way to me just yesterday...Claypool has always been one of the better publishers out there and they're more than deserving of support. As many of you may know, several months ago, Diamond Distribution elected to stop carrying our line of Claypool Comics ("Elvira® Mistress of the Dark," "Soulsearchers and Company," and "Deadbeats"). Since Diamond is the only game in town for getting product to comics retail outlets, that effectively ended our publishing operation. 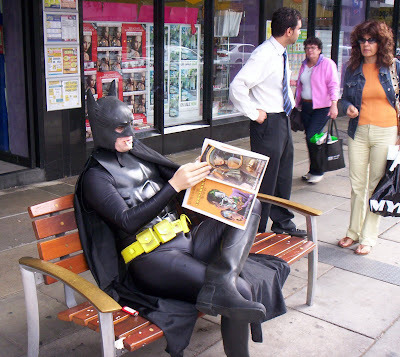 Could this be the best superhero movie never made? If the link above doesn't work then click here and watch it. The photo you see here is an actual action shot of ole F.W. Last night the Kidlet told us that she'd just walked into the kitchen to find F.W. 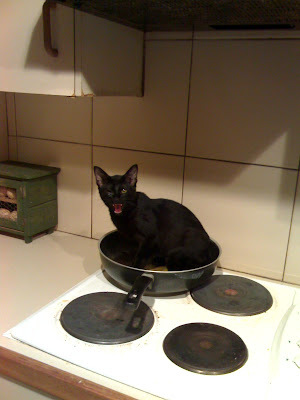 in the frying pan. I thought she meant that he was drinking out of the sink, so in I walked and found this. I grabbed the camera phone, F.W. struck a pose and BANG! There he is. Oddly enough this photo sums him up perfectly - he really is that thick. Nice looking cat though, even if he is all leg, foot and tail. I heard word about artist Artie Saaf's passing last week in the form of a message that his son, Steve, posted on a mailing list that I frequent. Sadly I have to admit to being somewhat ignorant of Artie, something that I aim to remedy in the near future. In the meantime Mark Evanier has written an obituary about Artie that says far more than most people could. You can see a list of what Artie did do on Jerry Bail's Who's Who site. it's always sad when one of the pioneers of comic book art passes away, and in this case it's no exception. My thoughts go out to Artie's family and hopefully we can post something with a bit more detail in the coming weeks. 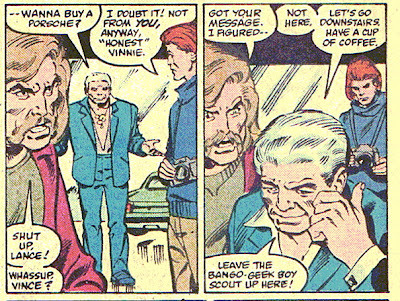 Just to lighten the mood a little, here's a sequence from Amazing Spider-Man #286 featuring our man of the hour, Vinnie Colletta. Written by Jim Owsley (aka Christopher Priest), edited by Jim Salicrup, penciled by Alan (Might As Well Be Jim) Kupperberg and inked by Jim Fern. Funny little sequence isn't it? 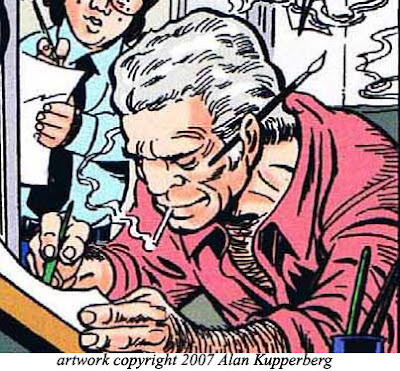 I've always been amused to discover these little touches in comic books - one of my all time favourites was Jim Mooney inserting himself into an issue of Spectacular Spider-Man as one of Peter Parker's college professors, but the all time kings of such actions would be John Byrne and Dave Cockrum, who frequently inserted themselves and other Marvel staffers into various Marvel titles in the '70s. Still if anyone else has Vinnie, or any other comic professional drawn into a comic book then by all means let me know where and we'll throw 'em all up onto the site. Vinnie Colletta. Much has been written about Vinnie in the years since his passing (1991), not all of it is true or accurate. Speak to a professional artist and more often than not they'll have an opinion on Vinnie. "He was a no talent, no good hack," they say, "a bum that ruined Jack Kirby's artwork by haphazard inking and shortcuts." In some regards they're right, he was a bit of a hack. He also indeed did take a lot of shortcuts in his work, in some cases he erased the pencils so he'd not have to ink them. Jack Kirby would draw detailed backgrounds only to see them simplified by Colletta. Yet there were other sides to Vinnie.